SoundRoots World Music & Global Culture: Fantastic, Frustrating FELA! The personality of the musical FELA! echoes that of the man himself: brilliant, insightful, sexually charged, compelling – and simultaneously inconsistent, frustrating, and flawed. Afrobeat – a blend of soul, funk, and Latin sounds with traditional Yoruba sacred and dance music – is today globally popular; bands devoted to the style are found in (among other places) Chicago, Seattle, LA, Portland, Austin, New York, London, Lisbon, and, of course, Nigeria. Lagos was the incubator, where the pressure of a military dictatorship combined with the social and musical upheaval of the 1960s that leaked from Europe and the USA started the young Olufela Olusegun Oludotun Ransome-Kuti on what would become an extraordinary journey. The music from the 10-piece band is rich and juicy. Mostly Afrobeat, yes, but also bits of traditional Orisha sacred music, Juju, Highlife, even a brief snippet of pure James Brown (channeled through Sierra Leone singer Geraldo Pino). The music – along with the dancing and singing of a talented and ridiculously fine-looking ensemble – is reason enough to attend. But even devoted fans of the musical style will probably learn something about its originator as they're doing the chair-dance. The show doesn't pretend to be a full biography of Fela; rather, it drops in bits of history to explain the turbulent period in the late 1970s when Fela's conflict with the Nigerian military dictatorship came to a violent climax. Fela's mother, Funmilayo Ransome-Kuti, looms large as an influence in his education, and as a presence in his life even after her death. Her importance to his story is made clear in the portrait of her that hangs over the stage throughout the production. 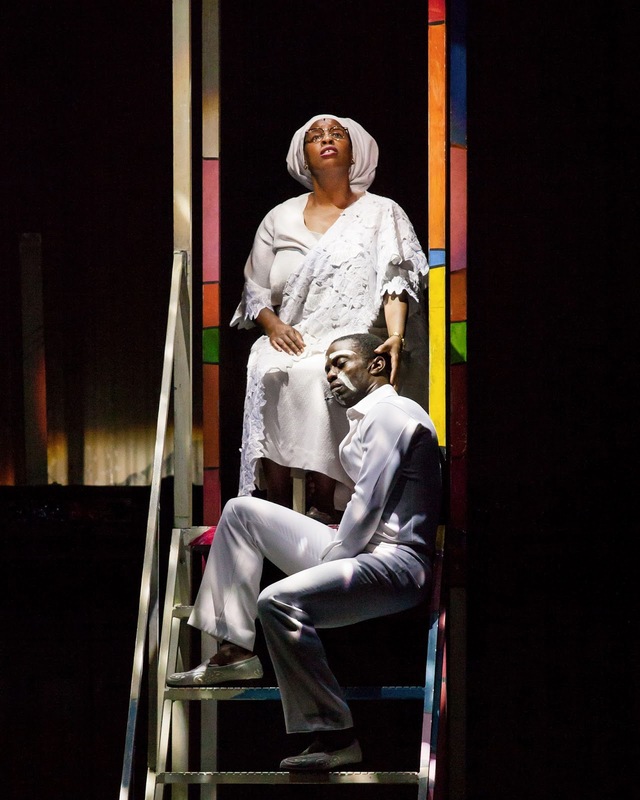 Indeed, Melanie Marshall as Funmilayo steals almost every scene in which she appears with commanding stage presence and tremendous voice (“Trouble Sleep”). But the show is primarily focused on Fela himself. 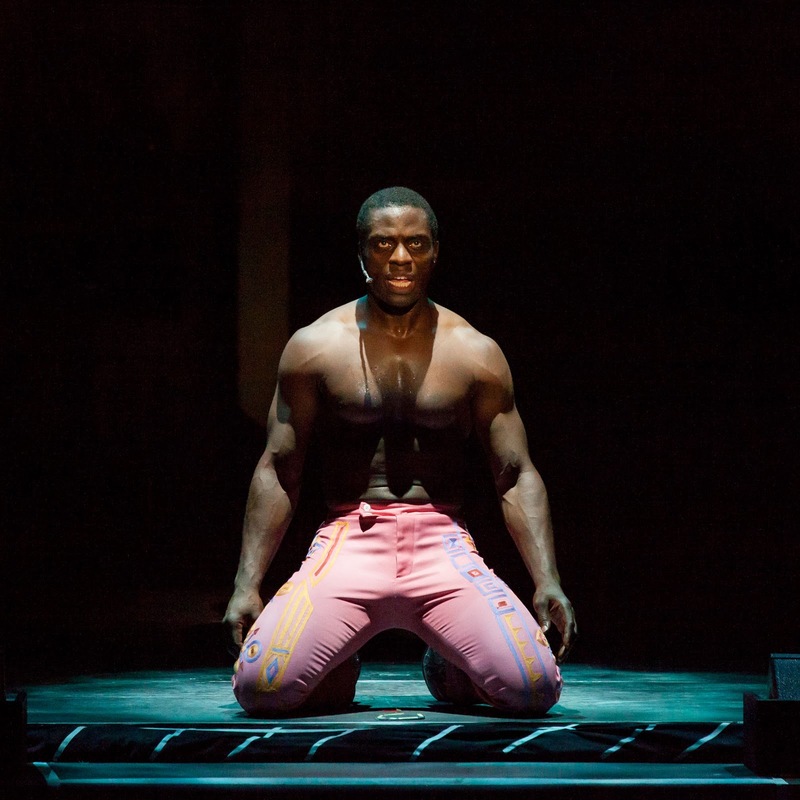 Adesola Osakalumi does an impressive job of conveying Fela's drive (musical, political, and sexual) and musical acumen as well as his conflicts and doubts, though at times it feels he's holding back on expressing the man's sheer intensity of personality. Besides Fela and Funmilayo, only one other character becomes at all multidimensional. 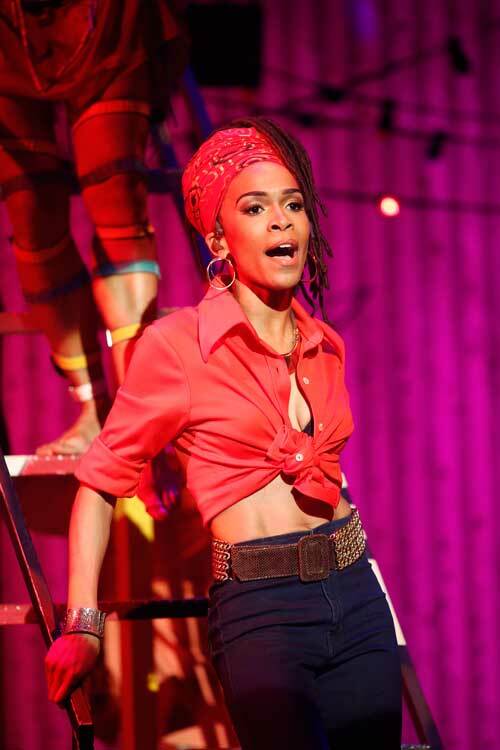 And that's being somewhat generous, as American activist Sandra Izsadore (played by Michelle Williams) features primarily in one short scene in which Fela woos her and in return receives a primer on Western Black Power, along with a reading list (“Upside Down”). (Williams, despite her impressive voice apparently has a clause in her contract that requires costumes that show off her thin limbs, which contrast starkly to the sturdy, fit physiques of the show's other women.) After this scene, however, Sandra fades into the background, at one point dancing alone on the top level of the set while everyone else cuts loose below. Is it an American perspective of Fela that portrays him as so alone? He's shown as having no close confidants and very little contact with the world outside his compound after trips to America and England. And there's no mention of his children (two of whom – Seun and Femi – have followed in their father's musical footsteps) or their mothers. Themes of government corruption, military abuse, and exploitation by multinational corporations loom large, and a few contemporary references reinforce the obvious truth that these problems are still with us. During “Coffin for Head ofState” caskets are paraded around the stage bearing the names of, among others, Travon Martin and Sean Bell. Darker still are the portrayals of Fela's torture in captivity and the military attack on his home (“Everything Scatter”). The high-energy first act raised my expectations, but the second act turned out to be something of a let-down, despite containing perhaps the show's best number, “Zombie,” a scathing best-seller about the mindless obedience of soldiers. I had high expectations for FELA!, and while the music, singing, and dancing are fantastic, the structure, storytelling, and casting (still looking at you, Williams), are more flawed than I would expect of a five-year-old show that has run on Broadway. This won't be the last attempt to tell Fela's story; with the passage of a bit more time I expect that Fela – much like a certain pot-smoking Jamaican reggae pioneer and activist – will be more widely known and appreciated, for both his groundbreaking music and his commitment to social justice. FELA! is a crucial early step in that process. FELA! plays at Seattle's Paramount Theater through June 2.